Make no mistake – there is no chance Aereo will survive longer than two or three years. That’s a best-case scenario. Broadcast Networks are dying (it’s true) and will be dead in their current form within five years. In five years, who is going to pay $8 a month for nothing? Where are all those little antennas going to go once Broadcast Networks cease to exist? What sort of business launches with this sort of insane hype that, at most, will only exist for five years? A Barry Diller company, of course. The only useful purpose Aereo has is that it will play a part in hastening the inevitable demise of Broadcast Networks. I wrote a couple of years ago that Broadcast Networks were in denial (BROADCAST NETWORKS: ON DEATH AND DYING – April 1, 2011). That the executives were longing for the old days of The Big Five. Now they’re just trying to survive at any cost. New shows aren’t working. The upfronts next month will be terrible (regardless of what the networks will actually say in their trumped up press releases and over-the-top presentations). But things aren’t completely dire. Chase Carey has the right idea but he shouldn’t say that he’ll make FOX a cable channel as a threat to Aereo. He should make FOX a cable channel because it would be a good business decision. It’s really the ONLY business decision. It is time for Broadcast Networks to accept that the world has changed. “The Mary Tyler Moore Show” is no longer the number one show. And new shows like “How To Live With Your Parents (For The Rest Of Your Life)” will not save you now. Basic cable and becoming just another button on the infinite media grid of the future is the only chance ABC, CBS, MBS, NBC and FOX have to survive. 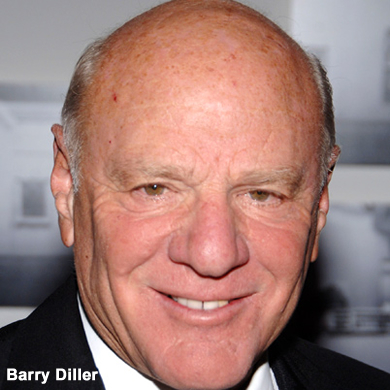 Love him or hate him (most hate him), Barry Diller has, once again, disrupted an industry in desperate need of change. If he wasn’t so gooey I would be cheering him on. For $20 million dollars, he is forcing a $50 billion industry to join the 21st century. Now that’s getting a bang for your buck. P.S. – Who knew Barry Diller enjoyed fishing so much? Here’s a great story of a recent fishing trip. I recently got Aerio and have basic cable too, getting Aerio for the convenience of having an online DVR recorder. Apart from some shows on PBS or network drama like “The Good Wife,” network shows are embarrassingly poor. It would be good if Aerio struck up a deal with TCM so I could watch, on my schedule, occasional of their classic movies too. The Movies channel on Aerio leaves some to be desired but their recent showing of “Anatomy of a Murder” made up for it. They don’t make movies like that anymore, alas. And Aerio responds to E-mail within a few hours. It’s a good company, and inexpensive too. I hope the Supreme Court makes the right choice (no pun intended), that is, the best choice for consumers. Aereo is expanding and not declining. The views expressed by the author in the URL are her own personal views. Aereo will be able to hold its own, or merge with another company, or a likely situation could be Aereo will be bought out by competing business. So far Aereo is a success and to think that Aereo will fail in five years time is premature thought. Eight dollars of quality streaming is considered value. If cable companies succeed in killing off broadcast TV it will be a black day. The cable industry is evil and predatory. That law prohibits the use of copyrighted material broadcast over public airwaves without the approval — and compensation — of its owner. But the law distinguishes between material used for “public” performances, shown to multiple people at once, and “private” performances, shown to a single individual. When a cable company rebroadcasts an ABC show, it is offering a “public” performance and therefore must pay the network retransmission fees. But because licensing payments are not required for private performances, people without cable can continue to use antennas to capture and record over-the-air television programs for their personal viewing. I hope Aereo wins, why should a 60 year old technology hold up the future? PS why should an industry that prides itself on “Keeping up with the Kardashians” and “fear factor” and the other reality shows, survive. They should be voted off the island, too.